Testing and standardization are firmly entrenched in the pharmacological imagination of western biomedicine and its public. Before a new drug can be put on the market, the U.S. Food and Drug Administration demands five rounds of trials. Approximately 70% of new ‘recipes’ fails to pass the first round. Similarly, the European Medicines Agency maintains a database of adverse drug reactions (EudraVigilance) which, growing of one million entries yearly, is used to monitor all pharmaceuticals on sale across the European Economic Area. Meanwhile, the media seizes upon the perils of untested cures as if on morality tales, policing the boundaries of modern science from potential intrusion from the miraculous and the charlatanesque. Pharmacy shop, Tacuinum sanitatis, 16th century (BNF, MS Latin 9333, fol. 51v). While not corporate giants, apothecaries thrived in every large hamlet and town of Italy, reaching spectacular numbers in metropolises like Rome, Naples, and Venice. Unlike free-lance alchemists and empirics, they belonged to the city’s official infrastructure of healthcare: they worked from a licensed shop, trained through formal apprenticeship and, like physicians and surgeons, belonged to a professional association or arte. This ‘trade brotherhood’ gave them bargaining powers but also subjected them to standardization rules and quality controls. 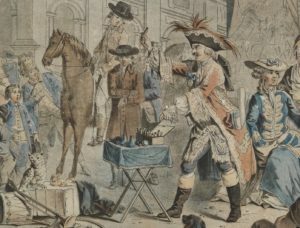 As disgruntled masters testify from the archives, in severe cases of infraction the apothecary could see the remedies he had belaboured on for weeks thrown into the gutter or burnt to ashes. So what did it mean to have ‘correct’ remedies that passed the test of shop inspections and satisfied “God and the public good”? As a historian of artisan knowledge I have learnt that infractions, those occasions when things go (deliberately) wrong, sometimes provide the best clue to understanding which methods of doing things were considered orthodox in the crafts. Apothecaries loved to speak of the abuses supposedly perpetrated by their colleagues. In Florence, for example, they conned customers by mixing expensive guaiac wood with the bark of mulberry trees. 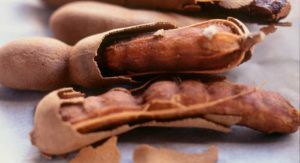 In Mantua and Padua, those with a fever and a bad stomach better beware the Lenitive Electuary, regularly adulterated with black sugar (instead of its fine white variety) and counterfeit tamarinds (mimicked by a paste made of old cassia and badly preserved dates ). These complaints were not the only ones to be voiced, but they are telling. They are not motivated by protestations from patients, who are remarkably absent from the writings of early modern apothecaries. Nor are they driven by doubts about the method employed to make the remedy from a set of instructions. 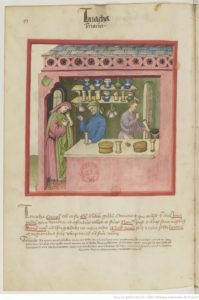 While household experimenters and professors of secrets were always seeking new formulas and ways to stabilise them, the corpus of remedies sold in sixteenth-century Italian pharmacies was fairly stable, and so were their recipes. What these criticisms suggested, rather, was that medicinal ingredients possessed a purity, and that this purity had been tainted. The rogue apothecary had played around with the ‘honesty’ of simples, diluting their strength or altogether replacing the ‘sincere originals’ prescribed in the recipe with fraudulent alternatives (often from the kitchen pantry). With this concern for authenticity in mind, I returned to the apothecaries’ writings, and especially to two bestselling pharmacopoeias, Girolamo Calestani of Parma’s Observations on the Antidotes and Medicaments Most Used in Italy (1562), and Giorgio Melichio of Venice’s Warnings on the Compound Remedies in Use in Pharmacy (1575). Leafing through these texts, I made a curious discovery. Repeatedly, key plant and mineral ingredients in their recipes were referred to according to their reputed truth or falsity: e.g. “true cinnamon”, “true rhaponticum”, “false stibium”, “false balsam”. Repeatedly, apothecaries stressed the importance of sourcing these authentic materials, while their absence was said to ruin the preparation. Even the use of substitutes began to be criticised. The practice of substituting one ingredient with another possessing similar qualities (quid pro quo), usually a local simple for an exotic import difficult to acquire, had been necessary since antiquity. Yet, the changing attitude to substitutions in the sixteenth century is summarised well by the Neapolitan physician Bartolomeo Maranta: “Substitutes are an abuse.” Never more so than for Theriac, the most celebrated antidote of Italian pharmacy and the toughest to prepare with over sixty ingredients. A Theriac with substitutes instead of true ingredients, Maranta declared, “will be itself in a certain way sick”. How should we interpret such appeal to the truthfulness of ingredients? At a superficial level, we can understand the apothecary wanting to reassure the public of the genuineness of his wares. After all, practitioners of pharmacy were often portrayed as profiteers and cheats. But, as I argue in my article “Pharmacy, Testing and the Language of Truth in Renaissance Italy,” something else had changed between the medieval period and the 1540s, when this terminology of trues and falses appears: Greek and Roman books on materia medica were reintroduced into western Europe. It is well known that the reappearance of Dioscorides’s On Medicinal Plants, Theophrastus’s On Plants and Pliny’s revised Natural History created as many problems as it solved for those who wished to implement their teachings. Many of the Mediterranean and Levantine simples described in them remained entirely unavailable during the sixteenth century, while many others were plagued by problems of identification and nomenclature. My sense is that this ‘Language of Truth’ was an intervention into this state of affairs. It helped the apothecaries get a grip on which was which among rare ingredients, and reflected their aspiration, shared with many contemporaries, of restoring the wisdom of the ancients. 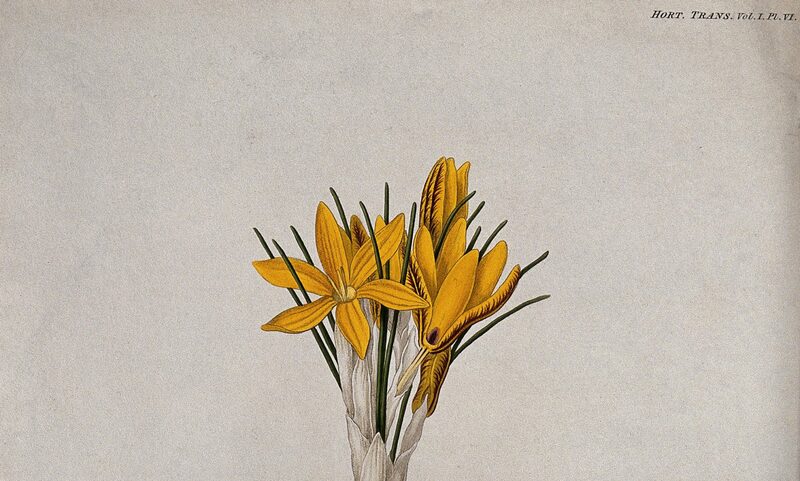 It also showed the increasing influence on pharmacy of the contemporary botanical renaissance and the ethos of naturalists who, for the first time, put nature in the foreground, liberating flowers, trees, animals and rocks from the need to be useful. Crucially, authenticity came to replace experimentation. As ingredients acquired more importance in the apothecary’s mind, the efficacy of the recipe began to be pegged to their presence and quality. Providing the remedy contained the true, correct ingredients its efficacy and fitness for human consumption would be guaranteed, with no need to involve test subjects or pursue the feedback of patients and colleagues. How much this ‘testing by truth’ differed from modern-day trials becomes clear when we turn to the contemporary idiom of the pharmaceutical industry: it is as if the apothecaries’ R&D stopped at the preclinical stage. V. Pugliano, “Pharmacy, Testing and the Language of Truth”, Bulletin of the History of Medicine 92/2 (2017): 233-273. See also the other articles in the same issue of BHM. Ricettario Fiorentino dell’Arte dei Medici e Spetiali di Firenze (Florence, 1574), pp. 45, 74; Giovanni Antonio Lodetto, Dialogo degl’inganni d’alcuni malvagi speciali (Padua, 1572), pp. 21-22. Giorgio Melichio, Avvertimenti nelle compositioni per uso della spetiaria (Venice, 1601), pp. 27-28. Bartolomeo Maranta, Della Theriaca et Mithridato libri due (Naples, 1572), p. 33. How did early modern individuals test and try their recipes and cures? This question is at the heart of the special issue of the Bulletin of the History of Medicine, “Testing Drugs and Trying Cures in Medieval and Early Modern Europe,” in which I participated as both a co-editor and an author. My article, “On Anecdote and Antidotes: Poison Trials in Early Modern Europe,” examines the ways in which early modern practitioners tested a specific kind of cure: antidotes to poison. It contains some information I discussed in earlier posts on this blog – here and here – but adds many details and thoughts about testing in general. Most cures, I argue, tended to be tested in the course of regular clinical experience. A patient got sick; a practitioner tried a particular remedy, observed the results, and frequently shared anecdotes of success or failure. The scale of this kind of testing could be small or large, but in most cases it involved patients who were already sick. Poison antidotes were a little different, because practitioners could actually create the condition of illness by giving poison to a test subject. In 1563, for example, the royal surgeon to Holy Roman Emperor Ferdinand I, Claudius Richardus, wrote a letter describing the marvellous virtues of bezoar stone. As avid Harry Potter readers will know, bezoar was an animal byproduct prized as a poison antidote and cure-all. Richardus recounted a series of marvellously successful tests he had conducted on bezoar at the Emperor’s behest. In two of them, patients received bezoar in the midst of a serious illness – the usual practice. In the other two, bezoar was tested in contrived trials on condemned criminals. Bezoar stones from the imperial Kunstkammer, Kunsthistorisches Museum Vienna. Photo by Alisha Rankin. This second kind of test – which I call a poison trial – has a long history dating back to antiquity. Many ancient kings, most famously Mithridates VI of Pontos (135-63 BCE), used condemned criminals to test poison antidotes, from which he developed his famous antidote and cure-all, mithridatium. The Greco-Roman physician Galen reportedly tested theriac, a derivative of mithridatium, on roosters, and versions of this test appeared in the writings of several Arabic physicians, including Avicenna’s highly influential Canon of Medicine. Medieval physicians repeated the description of Galen’s test as well. However, poison trials tended to be described as theoretical tests that one could conduct rather than as anecdotes about tests that had actually taken place, and they were mainly suggested as a means to test whether a batch of theriac was inferior, fraudulent, or old – not whether theriac actually worked. From the time of Galen, moreover, poison trials were conducted exclusively on animals, not humans. The dominant argument for the efficacy of these drugs remained anecdotal reports of their use on sick patients. In the Renaissance, poison trials expanded significantly, as did their role in medical communication. From the 1520s, powerful rulers began to revive the gruesome tradition of using condemned criminals to test a variety of poison antidotes – not just theriac. In addition, these tests were reported and circulated as anecdotes rather than being described as theoretical suggestions. The first known example comes from Rome in August 1524, when Pope Clement VII directed his medical personnel to test an antidote oil created by the surgeon Gregorio Caravita. He granted the medics two Corsican criminals who had been condemned to death by beheading. Both prisoners were given a strong dose of the deadly herb wolfsbane (aconitum napellus). Caravita then anointed one prisoner with the oil. The other, a “savage spirit,” was given no antidote. The first man survived; the other died in much agony. A second successful test was conducted on a Mantuan prisoner given arsenic. Soon thereafter, the medical personnel published a public service pamphlet describing these trials in detail. A shorter version of this anecdote also appeared in the famous herbal published by Italian physician Pietro Andrea Mattioli in 1544 (with a Latin version in 1554). Mattioli’s influence helped spread poison trials around Europe. From 1561-67, a number of contrived trials on condemned criminals took place under powerful princes, including Emperor Ferdinand I, King Charles IX of France, and Duke Cosimo II de’Medici. Significantly, royal physicians and surgeons spearheaded these poison trials, and they communicated the results in anecdotes that appeared both in private documents and printed books. Claudius Richardus’s bezoar trials were part of a series of such events. These anecdotes demonstrated careful thought in how the trials were devised and conducted. They described the trials in in excruciating detail, including the number of times a prisoner had vomited and defecated as well as the hour at which these events had occurred. In some cases, physicians attempted to created conditions that would lead to a useful outcome. Richardus’s letter described how food was withheld from a prisoner before the test, “so that one could be more certain of the trial.” This step came in response to a previous case in which the physicians had trouble getting the poison to work. Finally, physicians took care in reporting and circulating their reports about the trials, clearly imbuing them with significance. A series of poison trials on dogs conducted in 1580 by a German prince circulated in both manuscript and print as a detailed Observatio, a report intended to be shared. Poison trials represented only a miniscule part of drug testing in early modern Europe. Indeed, anecdotes about drugs used successfully on sick people helped drive the interest in new drugs from around the globe, as described in this post by R.A. Kashanipour. Nevertheless, the anecdotes about antidotes demonstrated significant developments in both testing practices and medical communication. To find out more, read my article! 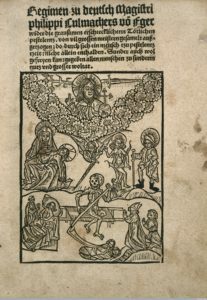 Richardus’s letter, to Archbishop Nicholas Olahus, was later published in Latin and German. Thomas Jordan, Pestis phaenomena (Frankfurt, 1576), 621–630; Johann Wittich, Bericht von der wunderbaren bezoardischen Steinen (Leipzig, 1592), 21. Galen’s poison trial appeared in the treatise On Theriac to Piso, which may be spurious. However, scholars in the Islamic world and Europe assumed it was authentic. See Robert Leigh, On Theriac to Piso, Attributed to Galen: A Critical Edition with Translation and Commentary (Leiden: Brill, 2016). The pamphlet was signed by the physician Paolo Giovio, the apothecary Tomasso Bigliotti, and the senator Pietro Borghese. 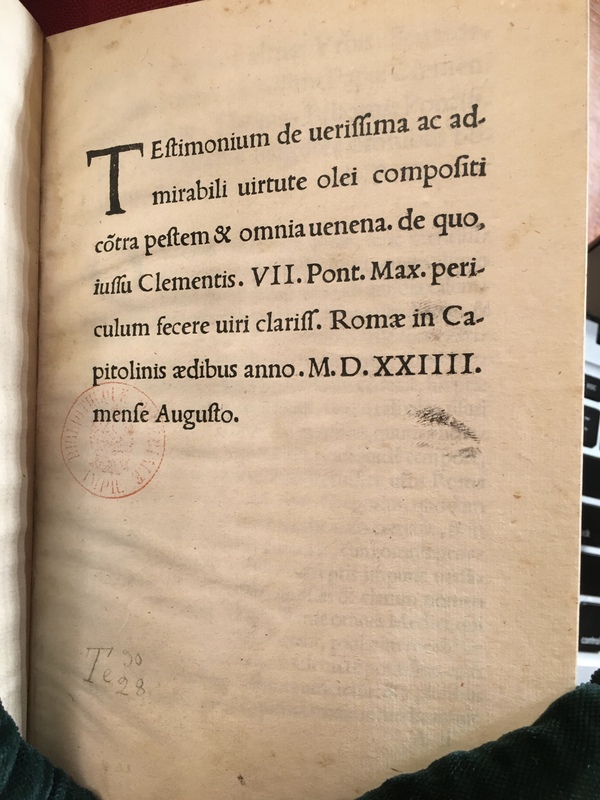 Testimonium de verissima ac admirabili virtute olei compositi contra pestem & omnia venena (Rome, 1524).